I’d been a bit reluctant about The Table, a multi-course fine dining chef’s table experience, as I couldn’t quite work out whether the ten-seat, single-sitting, New Town curio on Dundas Street would work better (or at all) if you went in a two, four or whole restaurant party. As it turned out, its exceptional busyness meant I had to book well in advance and could only get a week night seating for two, so the decision was helpfully taken out of my hands. Having made the booking without agreeing who I would take, my friend Malcolm mentioned his interest in going at our festive lunch at the Stockbridge Restaurant. That settled it without further fuss. After pre-dinner liveners at Bramble, we crossed the threshold of the narrow but oddly magical little hideaway bang on 7pm. We were greeted by chef Sean and his glamorous assistant Keith. We then took up station in comfortable high seats at the beautiful, marble-topped bar. It’s a BYOB (no corkage) set-up, at least for now. They offered to decant our red, but while our Azul from Vino was pretty good stuff, it didn’t seem worthy of this hallowed treatment. We cracked on with a good Chablis to begin with. From the open kitchen, the guys remained completely calm and poised throughout. 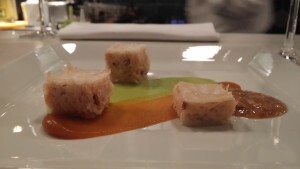 Each course was introduced with assurance and meticulous detail. First up we had canapes of deep fried pasta filled with bacon and topped with aged parmesan. Then there was puff pastry topped with squid ragu and cumquat. 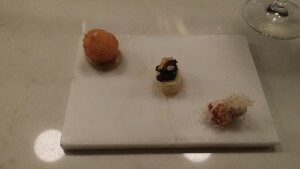 The third morsel was a truffled rice ball with fontina cheese sitting atop some chestnut cream. These set the bar at exceptional, a standard that was maintained throughout. The elegant starter brought together towers of crab and vanilla mayo with a topping of crisp radish. Colour and flavour bursts were provided by sauces of persimmon and lime, with wonderful toasted macadamia nut paste. Cheeky humour was to the fore in the spectacular “Golden Wonder cheese and onion”. 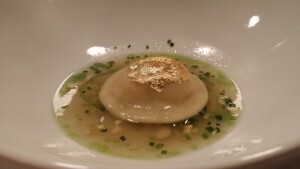 This was a 23 karat topped raviolo of Isle of Mull cheddar with textures of onion in a sweet onion broth. The whey buttered toast, with the bread from nearby bakery Archipelago was mind-blowing. 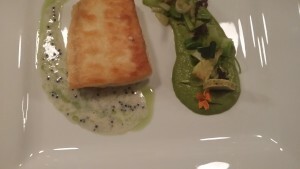 We then moved on to halibut with crow garlic and caviar sauces, and Perthshire wild leeks prepared in a range of different styles. It was superb. 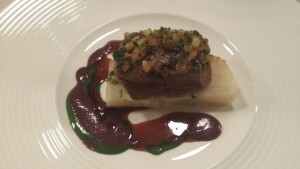 Venison fillet from local butcher George Bower was a fittingly regal main course. The salami and parsley crust was magnificent. The hay-baked celeriac was just magic, as were the trio of sauces. And then we moved on to the highlight dish of the evening. 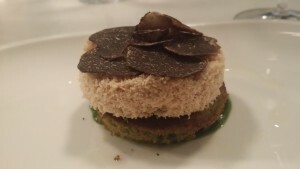 Apple and spinach puree was topped with a pistachio sponge, then foie gras and decadent black truffle. 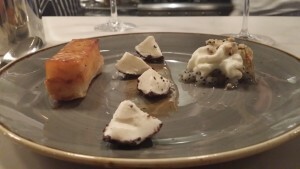 That’s right – foie gras and truffle as the pre-dessert. The chilled, powdered foie gras was earth-shatteringly impressive, with its richness captured in a dish of exquisite lightness and delicacy. 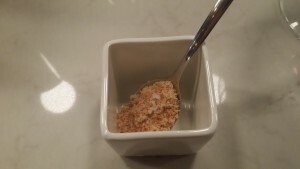 We then had a spoon of powdered salted caramel which basically turned into a Werther’s Original in your mouth. It was playfully delectable. Dessert was a pineapple tarte tatin, with coconut, dragonfruit and yuzu. Words fail me. 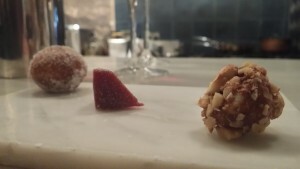 We rounded things out with espresso which came with petit fours of poached pear in hazelnut crumb, pate de fruit, and a warm banana doughnut, which was extraordinary. It was a fitting high note on which to end this blockbuster meal. So overall, The Table marks the second restaurant in 1,500+ reviews that I am pleased to award 20/20. Without question, this is the finest restaurant we’ve visited in Edinburgh. I was very glad to share it with a treasured friend and felt quite moved by the whole experience. When food is prepared to this standard, it’s an honour and a privilege to be the presence of the chef who has conjured the dishes into being. In chef Sean Clark we have an Edinburgh legend in the making. Visit The Table soon and visit it as often as you can.